A 70-year-old yachtsman who was dramatically rescued after falling into the River Conwy, returned to thank his RNLI rescuers for saving his life. David Stocks from Llandudno fell into the water at 12.15pm on Saturday afternoon as he tried to board his boat on the River Conwy. He quickly drifted out to sea with the outgoing tide, but managed to grab hold of a vessel to try and stay afloat in the freezing water until help arrived. Luckily some of Conwy’s RNLI volunteers were working nearby when the call for help was received. RNLI volunteers Greg Donald, Pete Hughes and Alan Flood launched the lifeboat within four minutes of the pager’s alarm. It was a real team effort for the entire RNLI crew, with the shore crew all coming together to ensure a successful rescue. The crew quickly located Mr Stocks and rushed over to help. Due to the extremely cold temperatures, he was barely conscious when the volunteers arrived on scene. 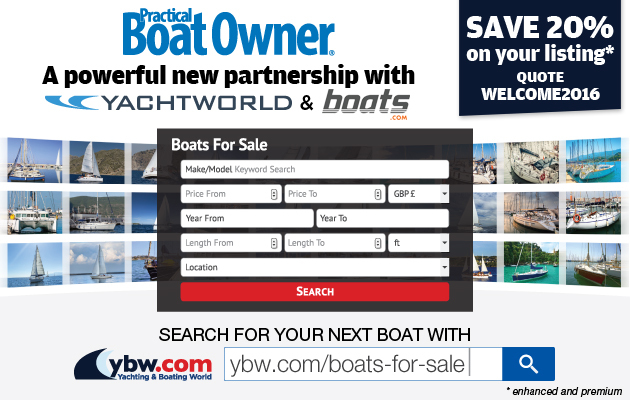 David, who is originally from Bradford, said: ‘I was attempting to reach my yacht to collect some tools, the weather was pretty rough and the next thing, some spray washed over me and I’m in the water. ‘I’m not the kind of person to give up, but it got to the point where I just couldn’t hold on any more. I just didn’t have enough strength. ‘I was in for 12 whole minutes and I felt every single second, it felt like an incredibly long time. At one point I looked at my hands and they were white, there was no life left. Fortunately, a man on the pontoon was able to offer help to David and called for assistance from the RNLI. When the lifeboat reached the scene, RNLI volunteer Alan Flood was immediately placed into the water to help support Mr Stocks and keep him afloat in the freezing river. 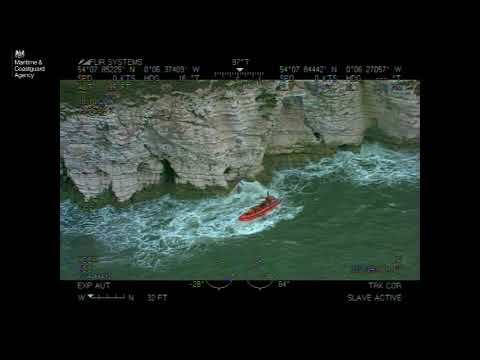 Greg and Pete then assisted the two into the lifeboat and rushed Mr Stocks back to shore to an awaiting ambulance. He was taken to hospital for further treatment. David added: ‘I saw the lifeboat arrive out of the corner of my right eye and the next thing I knew a man from the RNLI was just beside me dragging me out. On Sunday, the volunteer crew were delighted to see Mr Stocks walk through the doors of the lifeboat station to offer his thanks to the crew. 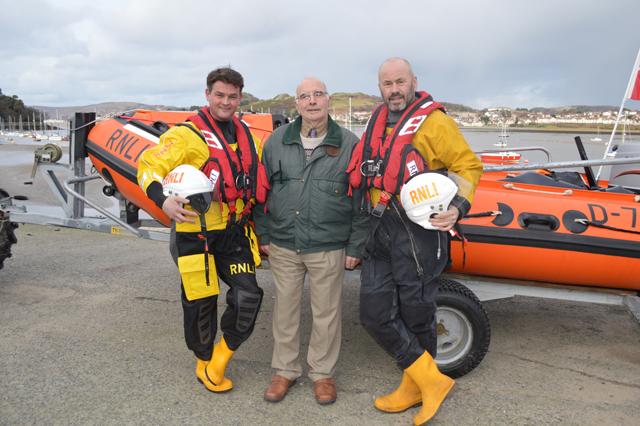 RNLI crew members Greg Donald and Pete Hughes with David Stocks. Conwy RNLI volunteer Greg Donald said: ‘It’s very rare that we hear anything from the casualty once they’ve left our care on the lifeboat; so I was great to hear that not only has he made such a fast recovery, but he had taken the time to visit the station yesterday to thank us for our help.